A reflection of the home’s past and the future, with an emphasis on family. The stunning home is situated idyllically amongst vineyards had recently undergone a significant renovation. 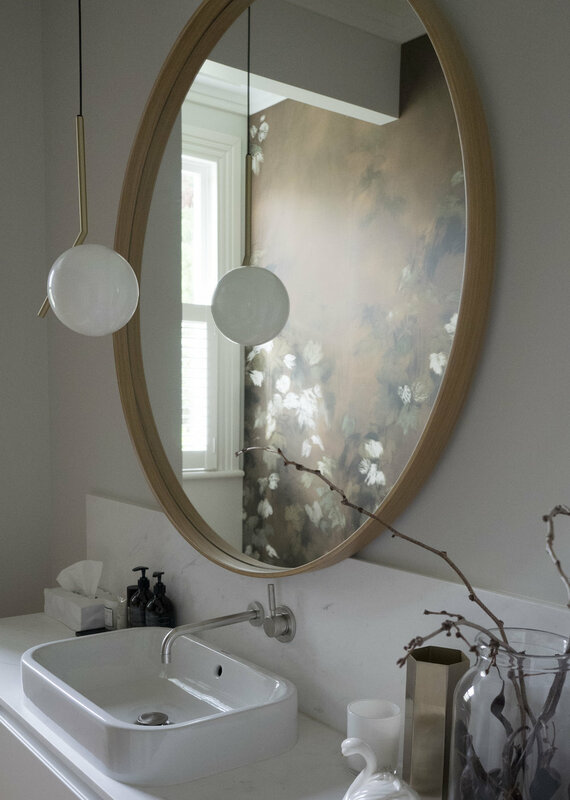 The interior spaces, selection of materials and furniture were designed and executed by Sonya Cotter Design. The original historic architecture gave us great bones to work with as we carefully transitioned it into vibrant & contemporary family spaces. 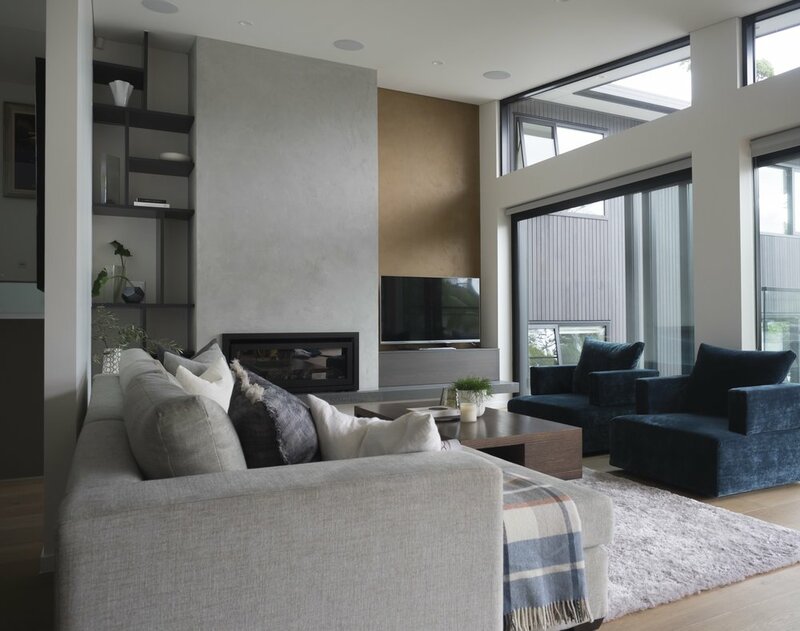 The palette of materials and thoughtful design has created a fresh and crisp interior with subtle layers of detail compatible with a contemporary lifestyle. Materiality & durability of the finish was important in grounding the kitchen design into the environment. Very early in the design of this home Sonya Cotter spotted this stunning stone slab and knew that it was the focal point and drama the kitchen needed. We showcased the stones natural flow by waterfalling it gracefully to the floor. This kitchen is absolutely the heart of the home and filled with light and natural organic farm produce. On weekends when the property overflows with guests and family the traditional Smeg Victoria Range is in constant use. Cleverly disguised doors within the back wall cabinetry lead though to a well appointed scullery, laundry and mudroom. The bespoke steel frame that clads the stone add to materiality and durability. This after all is a hard working kitchen on a hard working farm. The property is located at the heart of Auckland city legal district. Working with heritage constraints we crafted this refit with great care, taking it back in time. 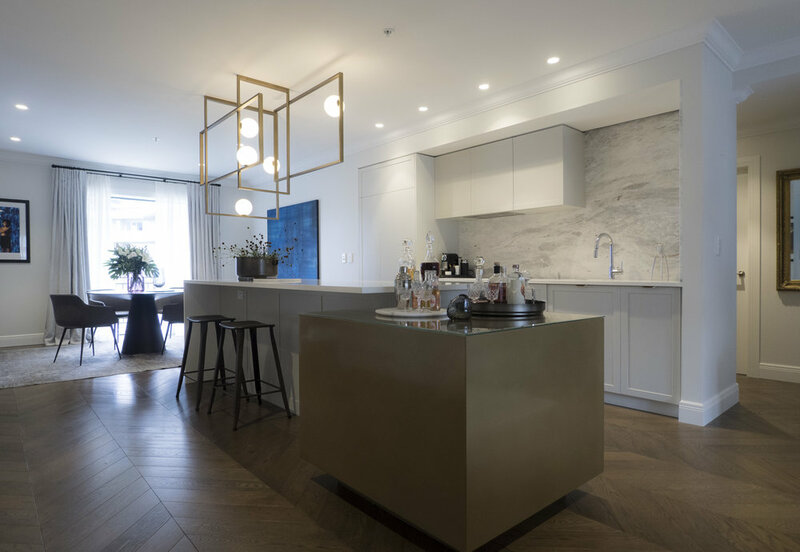 Our barristers at law clients who at times use the space as a central city apartment included in the brief a kitchen and island meeting area. 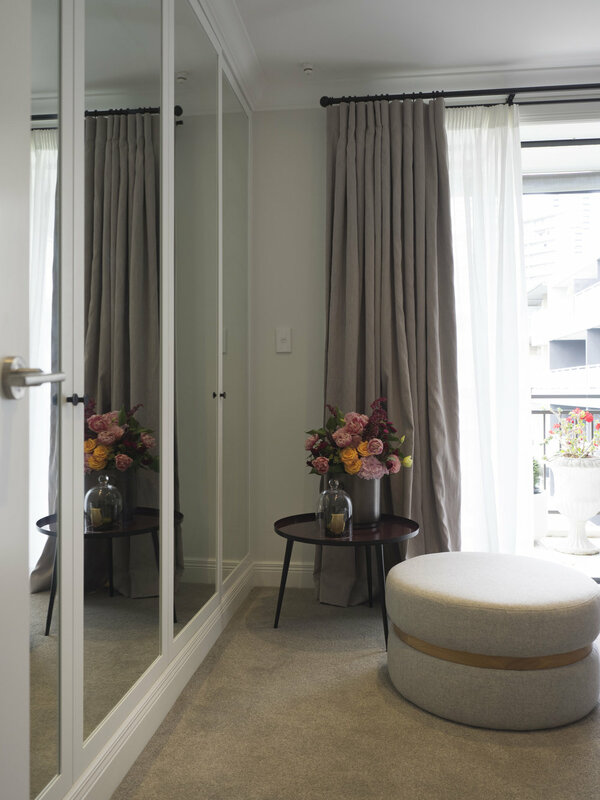 The city skyscraper apartment needed an update to suit our clients’ lifestyle. 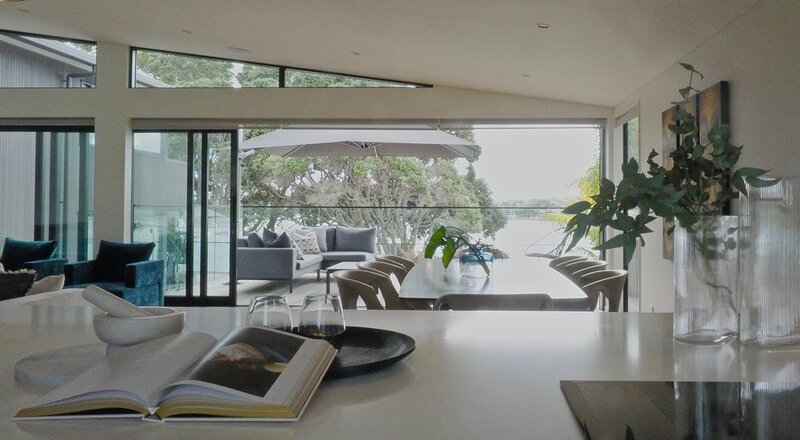 It was essential to take advantage of the views, while creating a warm and inviting interior. We replaced the clinical white bench & vanity tops with natural stone, updated the appliances, painted and installed new carpet. 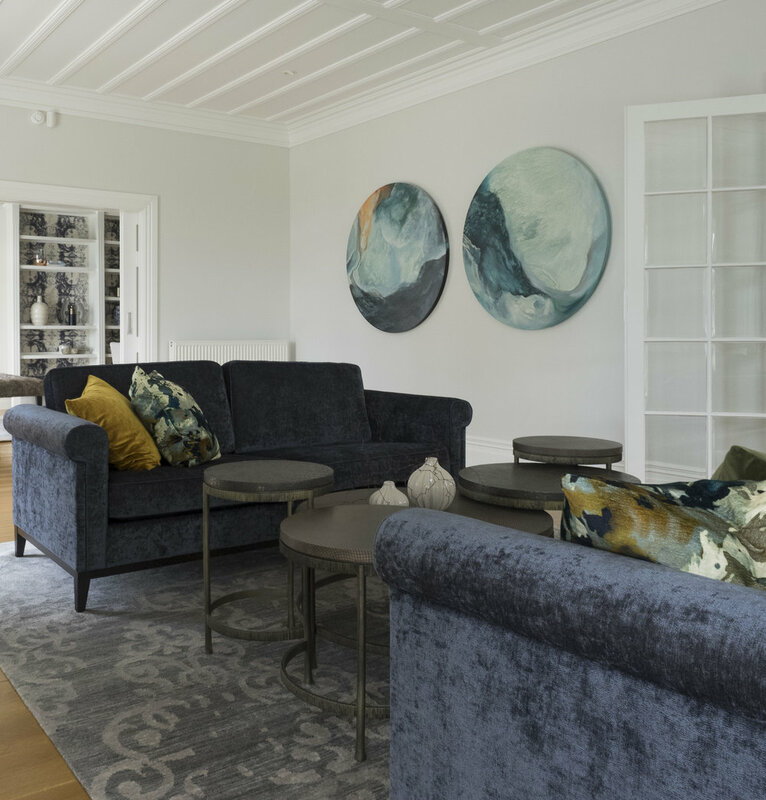 An eclectic selection of the furniture and rugs and soft grey walls created an inviting sanctuary. A restful respite from busy lives. 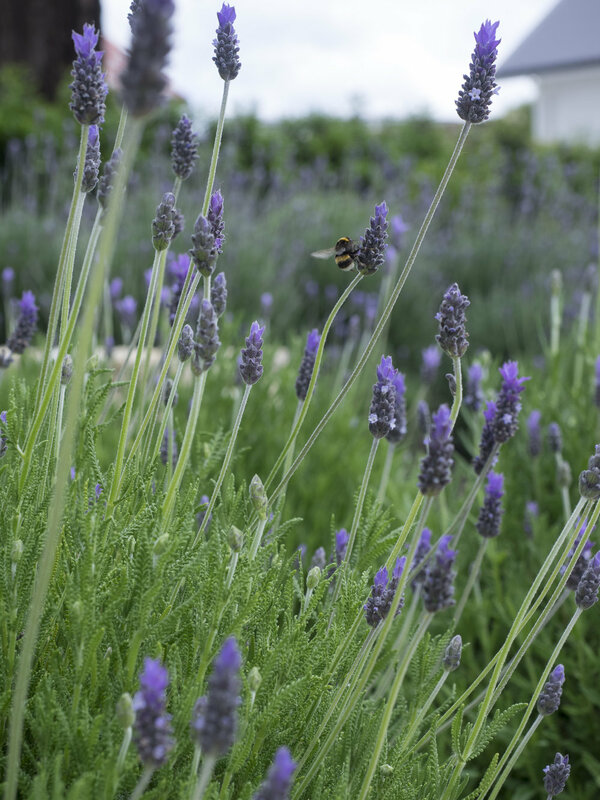 The guest cottage retreat is idyllically situated amongst the vineyards. The interior decor brief was to keep it calm and inviting. To create calm, we kept it the colours tonal. We used high contrast of darks and lights and mixed metals and textures for depth and interest. Four levels re-built from the ground up. The result was a grand statement acknowledging the home's former glory. Five bedroom, five bathrooms, three living spaces, two kitchens including a scullery, plus one large well appointed laundry. This projects bespoke features certainly kept the team a Sonya Cotter Design busy with the detail. Great clients and diligent liaison with contractors and suppliers which even included sourcing the limestone direct from Italy was a large part of the projects success. When the kitchen is the centre of the home it has to be many things, especially when the busy family all enjoy cooking. 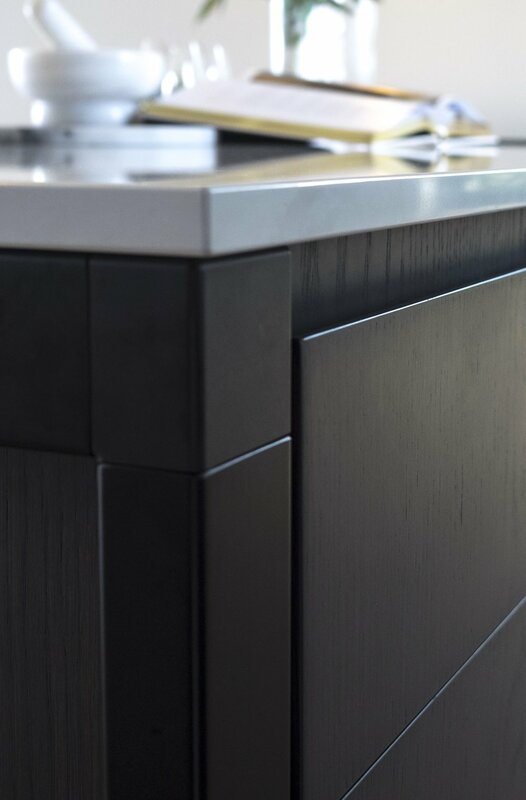 The expressive character of the crown cut timber veneer added a high end decorative element to this highly functional kitchen. The design played with the symmetry of the room creating bold blocks and powerful negative spaces. 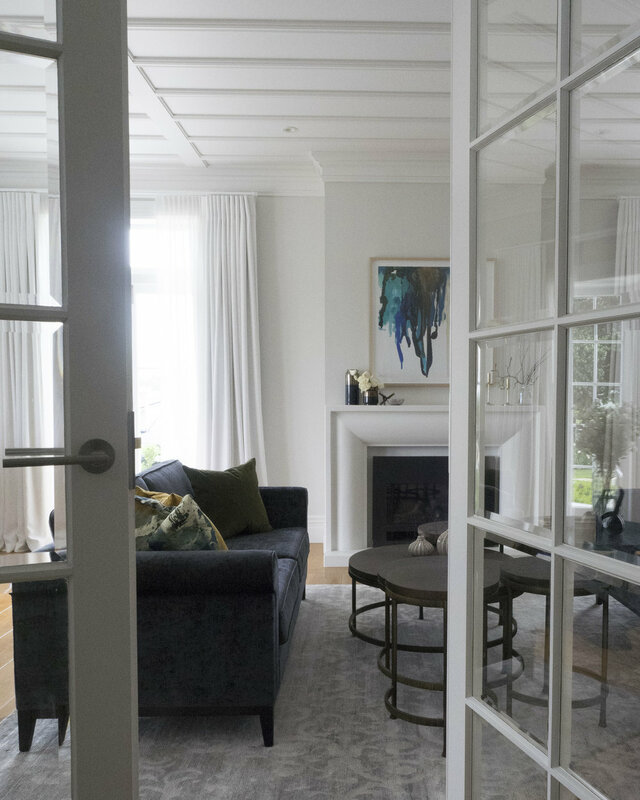 The space is bathed in warm light during the day and in the evening hidden LED lighting creates the cozy atmosphere needed in this open plan environment. The main kitchen hides away the integrated side by side Fridge & Freezer. The balance of the appliances feature a Wok Burner alongside the versatility of induction cooking. A Cool Draw, and Combi Microwave add to the functionality of the hard working scullery. An "out of the way" place to create regular snacks, coffees and work lunches. All easily cleared away with the help of a handy Dish Draw. We meet the clients very early in the planning of their home. 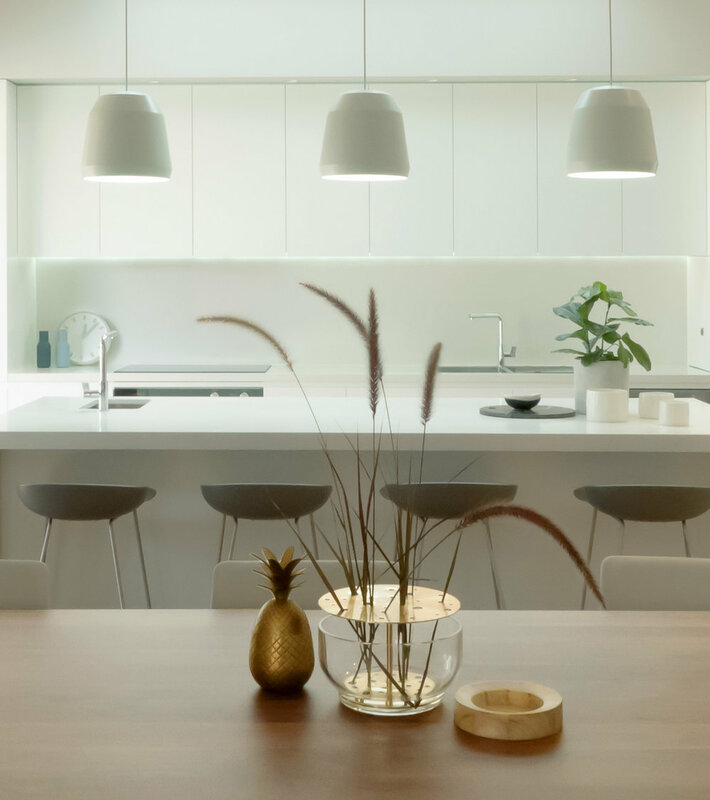 The kitchen was definitely the central element in developing the design concept and palette from which other spaces have flowed to create a cohesive and welcoming home. 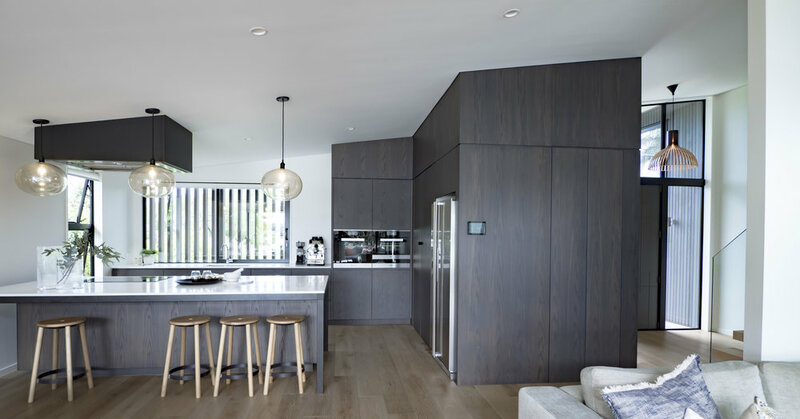 This stunning contemporary kitchen has a wall of dark stained oak veneer cabinetry cleverly housing a comprehensive scullery, fridge/freezer, pantry and a home office. 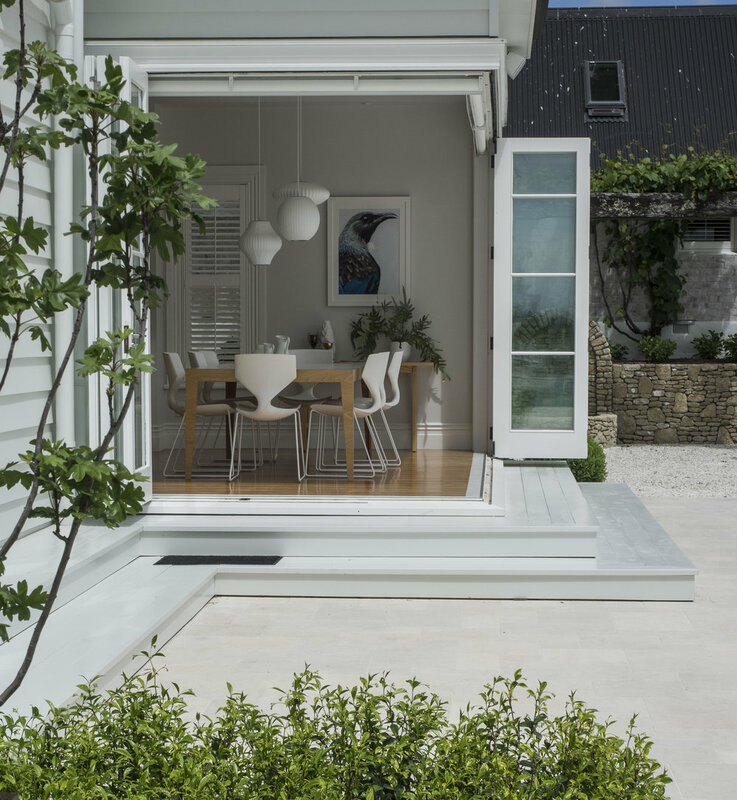 The island top is made from slate with the addition of a cantilevered timber slab overlay increasing the social flow around the island and adding the element of cohesion between the bench and the flooring. 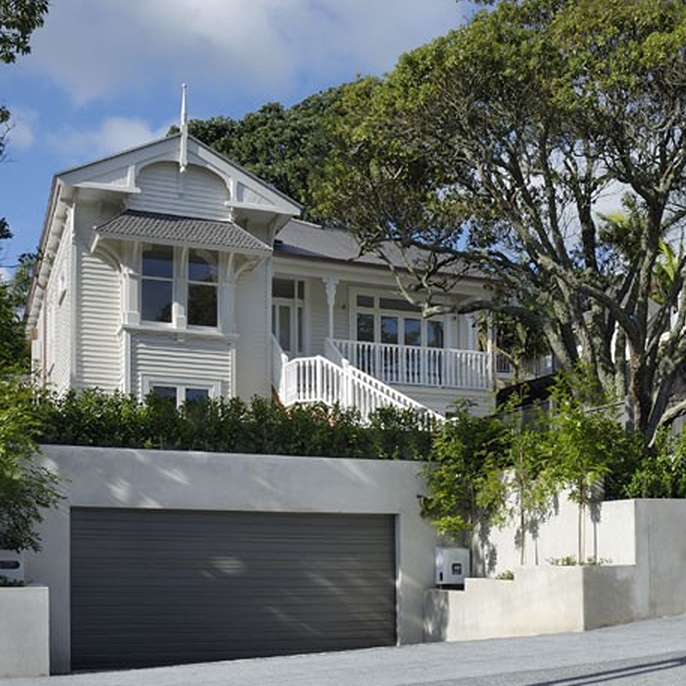 The property is located at the heart of Auckland city legal district. Working with heritage constraints we crafted this refit with great care, taking it back in time. Our barristers at law clients included in the brief was a kitchen and island meeting area. 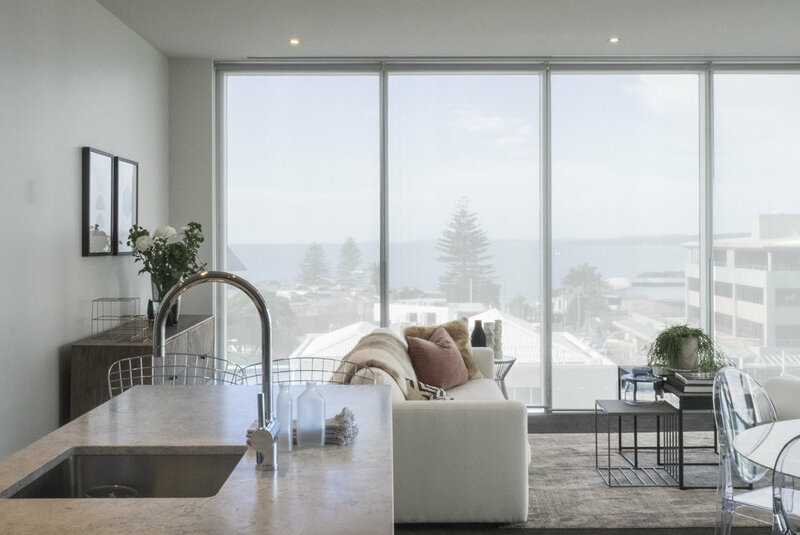 The brief for this beachfront holiday home’s kitchen was to keep it a simple bach kitchen but with the sophistication and functionality of a home kitchen. The key here was to maintain the access to the remarkable view which has been achieved by firstly housing the ovens side by side in a mid-level cabinet allowing a view port between this and the cabinet above and secondly installing a pop-up extractor fan in the bench, obviating the need for a drop down range hood which would have impeded the view. The bench top is Corian and the cabinetry a natural stained oak veneer. The splash backs are glass, chosen for their reflective quality and easy maintenance. This compact and cost effective kitchen has been part of a significant renovation to a classic state house. With the use of white glossy melamine and a rimu timber veneer detailingto match the exisiting polished floor, the clients collection of mid-century furniture and accessories feel right at home. the past with its traditional styling, as do the Cotswold tiles on the splash-back adding texture. The doors to the hard working service areas are seamlessly integrated into the cabinetry.